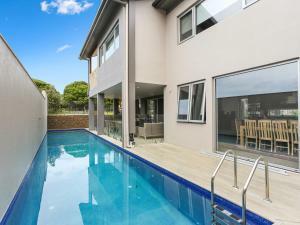 Located in Sapphire Beach, this holiday home is 8 km from Coffs Harbour. It provides free private parking. Free WiFi is offered throughout the property. There is a dining area and a kitchen. Towels and bed linen are available in this holiday home. Other facilities at Sapphire Views Holiday Home include a barbecue. Sawtell is 18 km from Sapphire Views Holiday Home, while Nambucca Heads is 49 km away. The nearest airport is Coffs Harbour Airport, 11 km from the property. When would you like to stay at Sapphire Views Holiday Home ? Please inform Sapphire Views Holiday Home in advance of your expected arrival time. You can use the Special Requests box when booking, or contact the property directly with the contact details provided in your confirmation. A damage deposit of AUD 300 is required. The host charges this 3 days before arrival. You should be reimbursed within 7 days of check-out. Each day we'll check prices and send you an email for your selected dates at Sapphire Views Holiday Home. If you don't have specific dates but would like to check prices for say next weekend or say next month we can check the price too. Click to write a review and share your experience of Sapphire Views Holiday Home with other travellers.